I cannot believe Christmas is next week!! If you are anything like me, I usually tell my husband not to worry about getting me much for Christmas as I usually just buy whatever I want or need as I go. But that also means, you better get me something. Ha! My poor husband. I'm a hard person to shop for in general, but I will say that with being a hairstylist you can never go wrong with buying me some amazing hair gear. A month ago I received my first pair of Big Baller Shears. I love them so much, that it got me thinking that if my husband would have known about these, he would have earned some major brownie points! 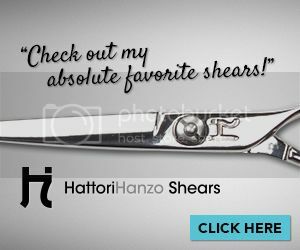 So point being, to all of my hairstylist peeps or friends that have a loved one in the hairstylist biz….I defiantly think you would amaze your stylist friends by getting a pair of some Hattoiri Hanzo Shears. Hands down these are my favorite shears! Not only would these shears give you the WOW factor we all hope to receive for giving presents, Hattori Hanzo offer payment plans same as cash! You can walk away with one of these bad boys for as little as $30 down. Yup, 30 bucks! So cheap, there's really no excuse why not to invest in these bad boys! The two I invested in were the the Menuki in 6.5 length and the Kime in length 6.0. Not only are they extremely high quality they make me look good while I'm cutting with them. I recently picked up a texturizer which I'll touch on a separate post.